Discussion in 'Patch Notes' started by EleonGameStudios, Jan 15, 2019. Hi Is anyone else getting shot threw POi's walls? Yes. I recently tried to approach a Floating Unknown Alien Artifact and was blown out of the sky by enemies inside the complex. Twice. mR_kAt and Kilndown like this. @Scoob I gotcha. I started my current game fresh with 9.2, so I doubt it's a carryover due to your game starting with a previous version. I have had the same drone attacks while looting the Titan sections, and if you use the 'map' console command to unveil everything, I've noticed they actually spawn in the area as I approach it, just outside of my radar, but in the general area, and sit there for a bit, then start roaming, eventually coming my way as if to investigate and attack if I don't take them out first. I figure that behavior is intended. The base attack behavior from the drones, and the turret response I've noted in my previous post, I'm guessing shouldn't be happening, but <shrug>, I've learned how to deal with it. just noticed, and it's happening all the time, that when I make energy bars the food processor is taking veggies out of the output bin to make them. not from the input bin.. annoying. and also.. on Trascendence server zirax are firing thru walls all the time when I'm on foot.. and if I get back into my sv after. did your guys intentionally change the name of the emergency O2 generators to Hydrogen generators? And any plans on taking away the ability of Zirax to shoot over 1000 M away from inside a base through mountains, or having them vanish if you kill one inside a POI that you have cored? It sort of would be kinda nice to get back to enjoying the game again. Cheers and thanks for giving us the moon again. mR_kAt, grg3d, stanley bourdon and 2 others like this. I'd like to see the "old" deployable hydrogen generators make a come back and get rid of hydrogen bottles being made in constructors. FPS is misery, even on a freshly generated map. I've gone back to 1080p from 4k now. Fastest settings, custom settings*, it's no matter, I still see me hitting 16FPS in some spots and it feels worse/slower than the meter shows! 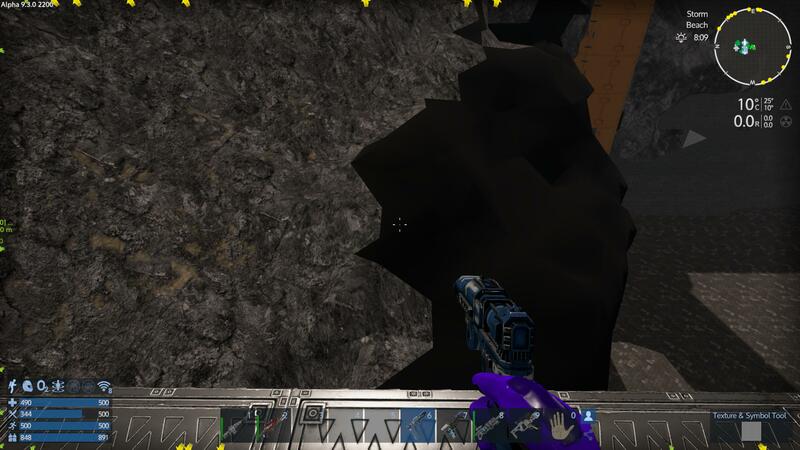 Is that the diesel blue 'fake rock' texture you get when using the filler tool? Now, it's telling me that the server won't allow it. Is there a new function that I've missed in all the patch notes? Dedicated server with 9.3.0 Build 2203 is now throwing "Internal Error Occurred" to all updated clients as of a few hours ago? So the server wouldn't patch correctly even though the steam process reports zero errors. I think this was because of a stuck EXE running in the background that mangled the data beyond repair? What I ended up doing (after a restart of the server machine to be safe) was installing 9.3.0 2206 from scratch, set it up identical to our server, and then I shut it down without a test connection, swapped the map data and EMP data for our 9.3.0 2200 backup, and then fired the server up. This worked. No seed/landscape issues, players that were admins are still admins, and hopefully the next patches will apply properly/work? keep these "fixes" in the experimental build please. having 3 to 6 builds between releases on the PUBLIC branch is unnecessary at best and at worst it seems that the studio is actually not trying to deliver any type of finished product. This is the windows10 of game development here folks. Never a finished product, always in development, if there are any investors of the game studio watching these forums please take your money to a studio with a more competent management staff. Developers at ELEON have a sincere discussion with the management. Do you see your patch notes.. Do you see all of the things you are changing between 3 to 6 builds? There is absolutely no way for you to have tested these things. you just chink wood, throw in in the public repo instead of the experimental repo where it belongs and expect people to do your work for you. I had just changed my opinion of this game. The Multi player is broken for sure as displayed on several public servers. The single player portion of this game was working. we'll see what these supposed fixes do to the game. I for one would certainly appreciate less updates to the public branch and let the people willing to experiment play on the experimental branch. Never a finished product, always in development, if there are any investors of the game studio watching these forums please take your money to a studio with a more competent management staff. It's an 'alpha'? Didn't you have to agree to that when you bought it? In an alpha stage you want to put out all sorts of content to test player reactions. To say we're the beta test team is wrong. We're ALPHA testers. If I was an investor I would PANIC if I saw these nerds throwing around money on 'looking investment worthy' vs. 110% focused on building out content to be tested. Wasting time/money to fluff up is a red flag the game isn't going to sell itself. I stopped reading for my sake and yours at that point. krazzykid2006, Taelyn and Frigidman like this. I didn't bother to read it given the initial format of text. Anything that poorly written, cannot have anything of value in it. Plus, sounds like yet another kid on steam who has no clue what Early Access development is all about. BagoHerder, krazzykid2006 and Taelyn like this.